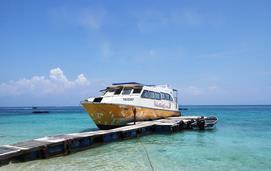 Perhentian Trans Holiday is a company with specialization in ferry service in Kuala Besut, Terengganu. The company was established on 12 September 2014 and continuing to carry business of travel & tours such as ocean activities, chalet and shipping stevedoring to its customers. Perhentian Trans Holiday is offering ferry services from Kuala Besut to Perhentian Islands and vice versa. They have maximum 8 daily departure from Jetty Kuala Besut to Pulau Perhentian but only 3 return trips from Perhentian Islands back to Jetty Kuala Besut. The service from Jetty Kuala Besut to Pulau Perhentian starts as early as morning 8:00am, with the last departure in the evening 5:00pm. Traveling duration by Perhentian Trans Holiday’s ferry to reach Perhentian island takes about 45 minutes.